On the 13th October, we welcomed over 110 members and over 30 leading mobile and tech brands to our 23rd Platinum Club Conference. Held at the Cotswold Water Park Four Pillars Hotel, members experienced a morning of engaging updates from our lead sponsors Alcatel, Bullitt (CAT), HTC and Samsung. 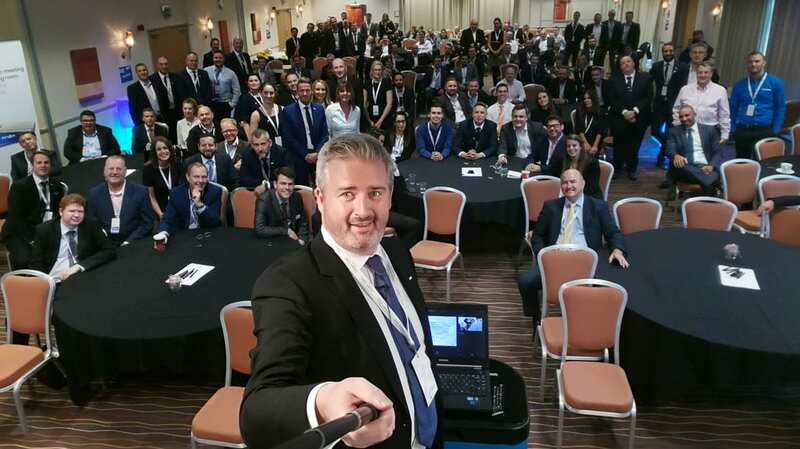 Andy Watts and Tony Harris provided members with an update on their exciting portfolio of smartphone, Tablet and connected life solutions. Martin Carter and Roy Taylor combined to excite members with live demonstrations of the Cat S60 thermal imaging smartphone (exclusively available through Data Select) and detailed the many different uses of this device. Greig Williams, Ben Walsh and Peter Gauden worked together to deliver a great brand, strategy and product update, focusing on the recently announced HTC One A9s smartphone, another Data Select distribution exclusive. Graeme Good and Vinny Robertson articulated the Samsung Knox proposition, Gear VR headset, Gear 360 camera and their B2B Technical Support Portal, all designed to support the channel. Throughout the afternoon, members mingled with our supporting Marketplace vendors and had the opportunity to fly a drone in our specially created indoor flying cage! From beacon tech to smart lighting, drones to VR, members got to play with the latest products and services available, all designed to drive additional revenues and create points of differentiation. The HTC Vive team were on hand to deliver one of the most immersive virtual experiences available. With one amazed reseller commenting after use “I have never been this amazed since the introduction of 3D printing”. Our Mobile Solution partners were on hand to discuss the latest advancements around insurance and finance, as well as the likes of Doro and Honor who showcased their latest devices. Our afternoon sessions enabled members to experience the many margin enhancing opportunities that we presented in-conjunction with our partners on Samsung Knox, B2B finance, insurance, Samsung’s B2B Technical Support Portal and Brandpath’s eCommerce & eFulfilment services. Back in March, we introduced our VR, Connected Life and Drones categories. As well as major interest from our key retail partners, many of our B2B members could also see, for example, how VR has a clear part to play in the business sector, as well as our ‘connected office’ proposition. We continue to evolve the brands within our portfolio, ensuring we have the most relevant products that today’s consumers demand and launched our 94 page brochure at the conference, in support of these categories. The event culminated with an Oktoberfest themed dining experience and entertainment, providing the perfect platform to network and reflect on the huge potential the increasingly evolving mobile and tech markets offer. We look forward to welcoming our members back to what will be our 24th Platinum Club event in March 2017. Not a Platinum Club member? Please contact your Account Manager for details of membership requirements and the benefits you can expect in return.